Ruby is a multi-platform open-source, dynamic object-oriented interpreted language, designed to be simplistic and productive. It was created by Yukihiro Matsumoto (Matz) in 1995. This example assumes Ruby is installed. The output will be immediately displayed to the console. Ruby source files don't need to be compiled before being executed. The Ruby interpreter compiles and executes the Ruby file at runtime. Now you do not need to call the Ruby interpreter explicitly to run your script. Alternatively, you can use the Interactive Ruby Shell (IRB) to immediately execute the Ruby statements you previously wrote in the Ruby file. Tk is the standard graphical user interface (GUI) for Ruby. 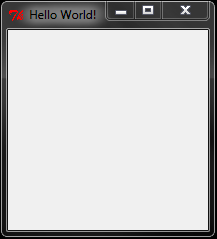 It provides a cross-platform GUI for Ruby programs. Start the main loop and display the widget. def is a keyword that tells us that we're def -ining a method - in this case, hello_world is the name of our method. puts "Hello world!" puts (or pipes to the console) the string Hello world!